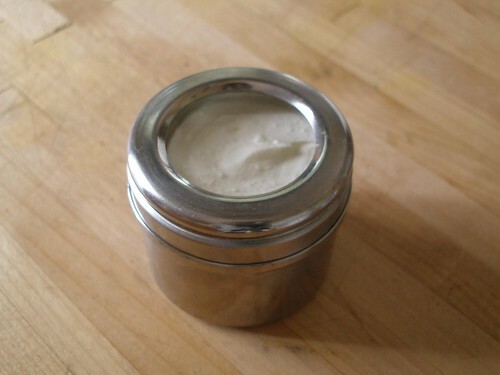 About a year ago I made my first batch of homemade deodorant from a recipe of Amy Karol's. In theory I liked the idea of natural deodorant (to avoid the aluminum that may, or may not, be linked to Alzheimer's because why tempt fate) but in practice, I never really used the stuff. So, I gave it to my sister, who loved it and used it all up. It worked so well for her that she convinced me to make another double batch and to actually try it myself this time. So I made a second batch, using the same recipe as the first. And I loved it too. It isn't antiperspirant, just deodorant, but it takes that job seriously. I've had zero stink. Yes, I still sweat, but I did that with regular deodorant/antiperspirant anyway. I actually have less issues with odor now than when I was using conventional deodorant. I did have 2 problems with the original recipe, though. 1) It was really stiff. To use, I had to scrape up a little pea-sized ball with the back of my fingernail and rub it around until it melted. 2) Halfway through the batch, the texture became more and more gritty, which started to irritate my underarms. I think the baking soda settled to the bottom half of the container before the melted oils had a chance to cool and solidify. 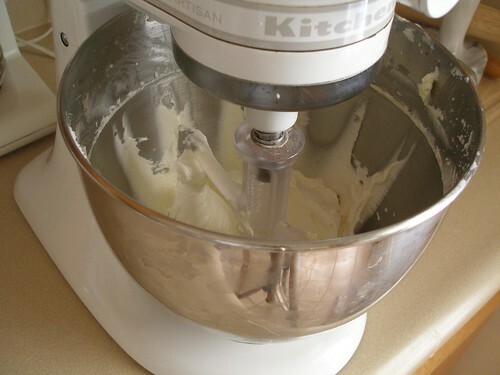 -To the mixer bowl add the shea butter, baking soda, cornstarch and Vitamin E. Using paddle attachment mix at med/high until it is lighter in color (almost white) and somewhat fluffy. -With mixer running, slowly drizzle in cocoa butter. -Mix on med/high for a couple minutes until nice and fluffy. -Place bowl in fridge for 5 minutes. -Repeat those last two steps as necessary until the mixture has cooled to room temperature. -Add essential oils and mix until blended thoroughly. -Spoon into lidded container, making sure to clean the mixer bowl immediately because someone in your family is guaranteed to come along and sneak a taste without realizing that it's deodorant. -Apply a generous amount to clean underarms, making sure to rub it in well. -Do the happy dance because you at least your deodorant isn't going to poison you. Important Note- Make sure to store this below the melting point of 75 degrees or so. Once it melts, the texture will be the same as the original recipe. I love that there are other people out there that are like me...most of my friends find me to be nuts. 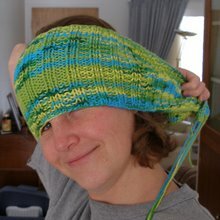 Well, anywho...I just wanted to leave you a quick comment and tell you your blog rocks! cool recipe! I'm glad you're one of "those people"... it's nice to have company. I've been using Angry chicken deodorant for over a year and a half and I completely love it. I'll have to remember your modifications for my next batch. We are happily "those people", too! The recipe we've used is on our blog, but we're excited to see a different one - we'll have to give it a try! this sounds very cool. i get jason's apricot deoderant (i never ever wear anti-perspirant--yikes! )...maybe i can make my own instead! thanks! Thanks Wendy for sharing this awesomeness with me. Oh and p.s. I love how fun all the people that commented seem! Really? Wendy, I love ya and this is just another reason. Good for you for being one of *those* people, even if I'm just going to go back to my Mitchum like I never saw a recipe for how to use my Kitchenaid to make deodorant. Gosh,like Aurora, I would go around smelling my armpits all day, especially with lavendar in it as I'm a lavender-aholic! I guess this makes a clever gift. For myself, a pinch of baking soda, straight up, works just as well, with less fuss. Thank you, Wendy, from the rest of us who are "those people." I would love to have you check out the give away on my blog!! I only ever wear deodorant, too, but have never made my own. I like your recipe because it doesn't use coconut oil (which I'm allergic to) ... so maybe I'll finally give it a go! I've been using home made deodorant for a while now. First it was just a mixture of baking soda and essential oils, but I found a recipe using coconut oil, baking soda, corn starch and essential oils (I use lavendar and tea tree oil). The mixture is really soft, and I stuffed it into an old deodorant dispenser. I keep it in the refrigerator, except when I want to "roll" it up :). It works great and smells awesome, and since my grandma had dementia - probably Alzheimer's, I need to take all of the precautions I can ;).